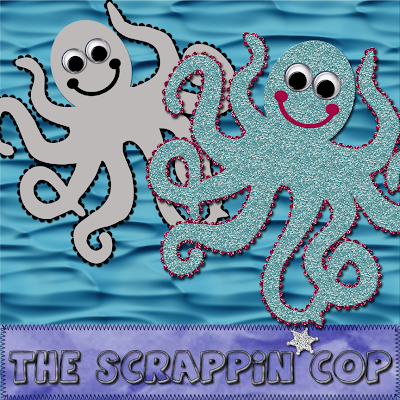 The Scrappin Cop: CU Octopus Layered Template! I had some time to work on another Ocean Pals template. Today's template is a little octopus. He needs something, something on his head I think but I was tired of messing with him. Thank you! Your blog post will be advertised on the DigiFree Digital Scrapbooking Freebie search engine today (look for timestamp: 14 Sep [LA 12:00am, NY 02:00am, UK 07:00am, OZ 05:00pm] ). awe this is just so cute, thank you very much!! A tophat. I think I shall give him a top hat. Then he can be a tapdancing octopus. LOL. Very cute, thanks! This octopus is ADORABLE!!! THX for sharing your talents with us!! Just 2 cute! I LOVE your work, Thanks so much for always sharing your talents with so many. He is absolutely perfect just as he is - thanks for another fabulous cutie! !